Googling 'New Order' (as I often find myself doing) I found this image on the Henri Art Magazine website. 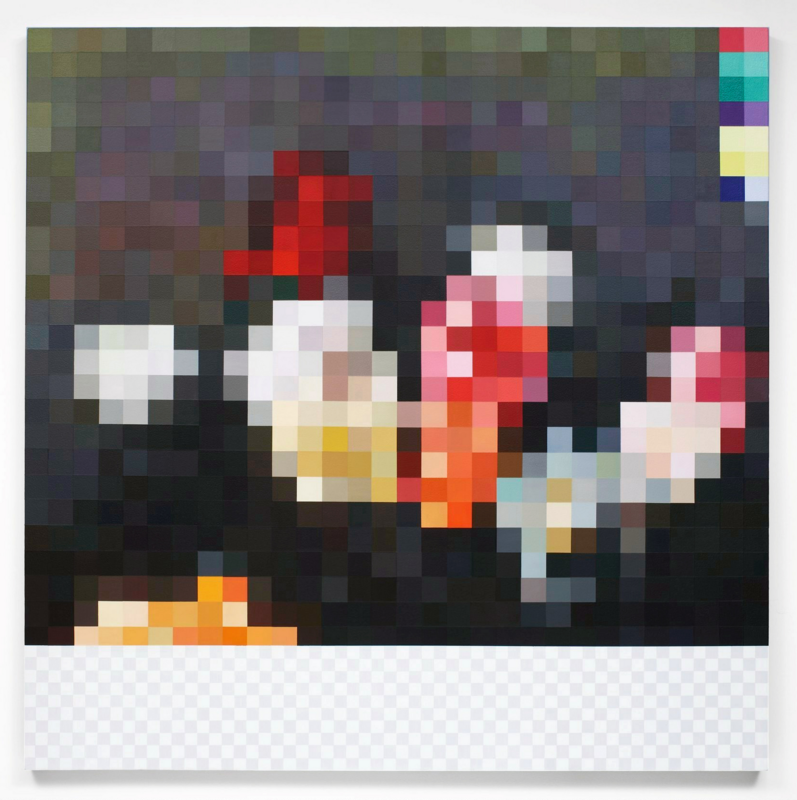 It's a painting by the New York-based artist Michael Zahn, called Power, Corruption and Lies, which takes as its reference a jpeg found on the internet, of the cover of New Order's album Power, Corruption and Lies, which was released on Factory Records in 1983. 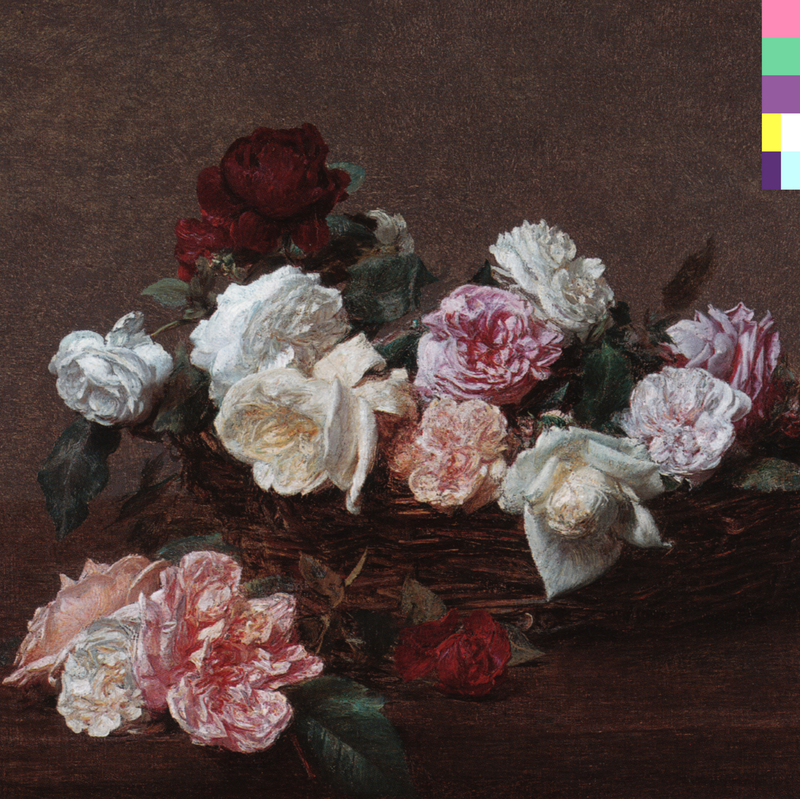 The cover was designed by Peter Saville and juxtaposes a painting, A Basket of Roses (1890), by the French painter Henri Fantin-Latour, from the National Gallery in London, with a colour coded alphabet that spells out the catalogue number - Fact 75 - of the album. There's nothing new about painters working from photographs but there is something very interesting going on in Zahn's work, looking at ideas about how we now receive images through the internet and how we understand and interpret them. I'm particularly intrigued with images that are analogue in source which are then digitised, with the digital version becoming the primary reference and source - I'm thinking of posters by Josef Müller-Brockmann which, when seen online, have a slick sheen that belies the surprisingly rough and hand-made feel which manifests itself when they are seen in reality. When Saville was searching for inspiration for the cover for Power, Corruption and Lies, he originally responded to a colour postcard of Fantin-Latour's painting; when the painting was photographed for the cover, the resulting image was, to Saville's mind, too brown - he preferred the grey tones of the reproduction. 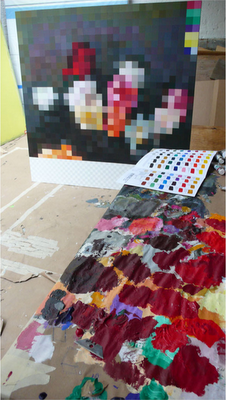 Similarly, one of the comments on the Henri website includes an image of the painting in Zahn's studio with the observation that 'I think that you can get a clearer sense of the extent of Michael’s love of color in this photo. I also find the idea of the conceptual nature of his work being mitigated and honed there on the palette.' It's surprising how large Zahn's painting is - something that is not apparent in the image that I first encountered. The context of the painting - in the studio, a physical object - changes its meaning in a similar self-referential manner to how Saville's juxtaposing of digital code with Fantin-Latour's painting changed its meaning. I've always liked self-referential artworks and there's something very satisfying about the movement of Fantin-Latour's original image between different media: oil on canvas - photograph of painting - printed album cover - photograph of album cover - jpeg of photograph - acrylic on canvas - digital photograph - jpeg on website. The roses are the constant element but, of course, paradoxically, Fantin-Latour was commenting on death and decay: the roses were dying as soon as they were picked and placed in a vase for the artist to capture for posterity. While I was researching images for my A Factory Alphabet book in 2009, I was unable to find a decent image of the cover of New Order's Blue Monday: all had been cropped badly or showed a re-issue that did not include the original metallic silver inner sleeve (Most of the reference books on Saville and Factory Records also use an image with black inner sleeve). I decided to redraw the sleeve in Adobe Illustrator and post this image on the Factory Alphabet website: I was interested in how a digital image, that had a purely digital source, might go into circulation as the official reference image for a physical object. Subsequently, Jeb Edwards digitally remade the cover image for his Recycle project including not only the metallic inner sleeve but also some of the printing errors and misalignments - and shadows that suggest this is a real object - that I had edited out of my slick digital version. The relationship between music and design is now fractured: I no longer browse record shops imagining the possibilities of what a record might sound like based on the image that the cover art is projecting. 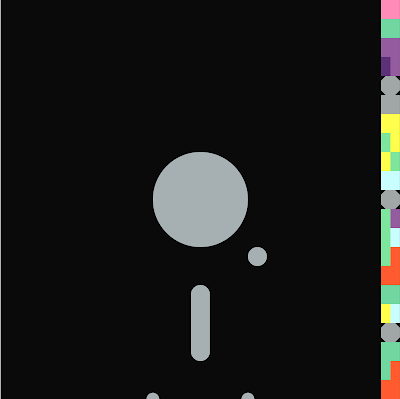 The physical object in the form of a 12" cardboard sleeve or even as a CD cover is now secondary to the music itself: design no longer has to sell songs nor do we have to imagine what an unknown record might sound like - a quick Google can usually locate an mp3 that will tell us all we need to know. As an art student in the 1980s, my exposure to art and artists was limited by the printed matter that I could find in the library and in bookshops - books, catalogues and art magazines - and, of course, by physical objects in galleries. This relationship has shifted with my connection to the internet - it's now much easier to research artists but the relationship is now a digital one. I wonder whether work that examine the relationship between digital and analogue, between representational image and physical object, will take on more resonance as we rely more and more on the digital or whether, as we lose contact with the physical object, that relationship will no longer be relevant.